The Rat Rantes Enzyme-Linked Immunosorbent Assay (ELISA) kit (ab213907) is designed for the quantitative measurement of Rat Rantes in cell culture supernatants, serum and plasma (heparin, EDTA, citrate). The ELISA kit is based on standard sandwich enzyme-linked immune-sorbent assay technology. A monoclonal antibody from mouse specific for Rantes has been pre-coated onto 96-well plates. Standards and test samples are added to the wells; a biotinylated detection polyclonal antibody from goat specific for Rantes is added subsequently and then followed by washing with PBS or TBS buffer. Avidin-Biotin-Peroxidase Complex is added and unbound conjugates are washed away with PBS or TBS buffer. HRP substrate TMB is used to visualize HRP enzymatic reaction. TMB is catalyzed by HRP to produce a blue color product that changed into yellow after adding acidic stop solution. The density of yellow is proportional to the Rat Rantes amount of sample captured in plate. Rantes (regulated on activation normal T cell expressed and secreted) is one of the natural ligands for the chemokine receptor CCR5 and potently suppresses in vitro replication of the R5 strains of HIV-1, which use CCR5 as a coreceptor. Peripheral blood mononuclear cells or CD4(+) lymphocytes obtained from different individuals have wide variations in their ability to secrete Rantes. 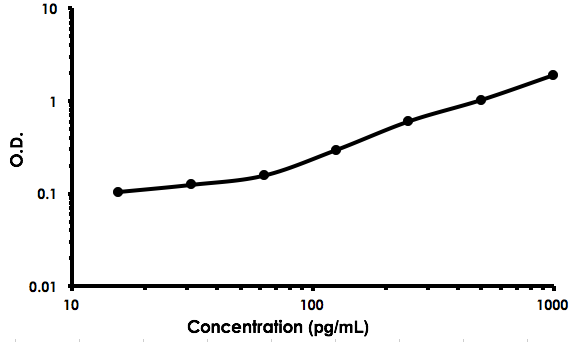 The Rantes gene product is predicted to be 10 kDa and, after cleavage of the signal peptide, approximately 8 kDa. Of the 68 residues, 4 are cysteines, and there are no sites for N-linked glycosylation. Rantes is expressed by cultured T cell lines that are Ag specific and growth factor dependent. Our Abpromise guarantee covers the use of ab213907 in the following tested applications. ab213907 has not yet been referenced specifically in any publications. There are currently no Customer reviews or Questions for ab213907.